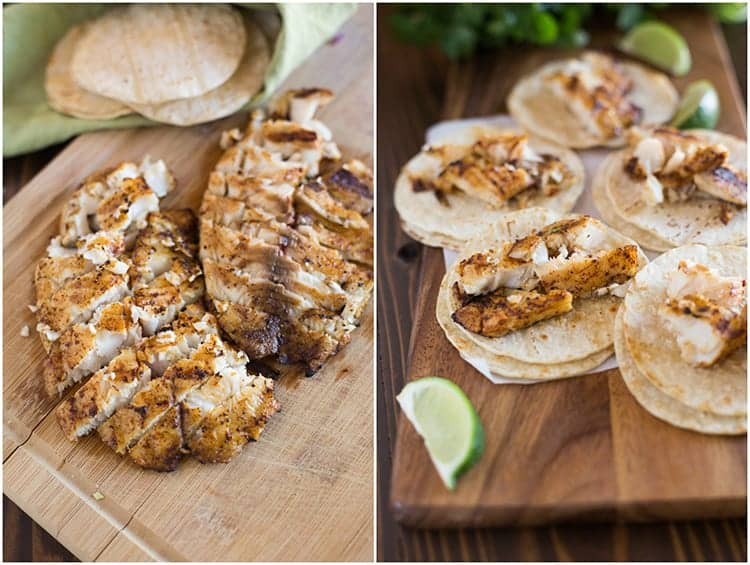 You just can’t go wrong with fresh, flavorful, and healthy Grilled Fish Tacos. 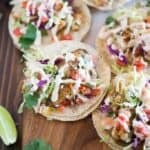 These fish tacos are loaded with all the best toppings, including cabbage, pico de gallo and a simple homemade white sauce, or “crema”, and they can be ready in less than 30 minutes. Oh Fish tacos, how I LOVE you! Some people like fish tacos breaded, or fried, but I personally love them best when they are grilled. The fish maintains it’s fresh, delicious taste and texture and it’s much healthier then breading and frying. There are three important components to making great fish tacos: white fish, shredded cabbage, and crema (a white sauce). Other parts of this recipe are adaptable, but those three things, paired together, are the trinity of basic fish tacos. 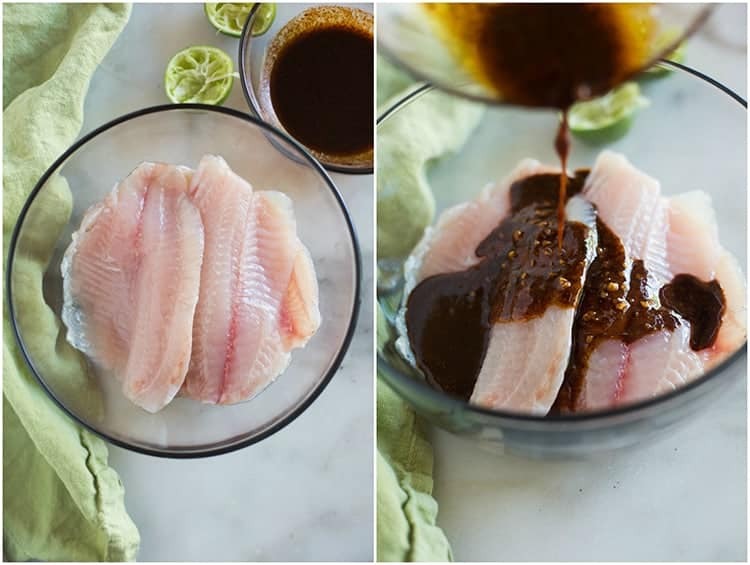 Lean and flakey white fish fillets are traditionally used in fish tacos because they are mild in flavor, cook quickly and are relatively inexpensive. Popular kinds of white fish for fish tacos include halibut, tilapia, mahi mahi, snapper, cod, bass and cat fish. When buying fish for these tacos I try to buy filets that are thinner because they cook faster and taste better with the marinade. Cannonball cabbage (the type most commonly found at your grocery store) or purple cabbage both work great for fish tacos, but be sure to take time to shred the cabbage as thin and fine as you possibly can! Authentic Mexican tacos always use white corn tortillas. Fish tacos, especially, taste really great with the that white corn flavor from the corn tortillas. I’m urging you, almost begging you, to please use corn tortillas and not flour tortillas for this recipe! I like to serve my fish tacos on two street taco size white corn tortillas, but the regular size will also work great. Cook the corn tortillas on your grill, or in a dry skillet, for just a few seconds on each side, until warmed. Don’t over-cook the fish on the grill. White fish cooks pretty quickly, especially on the grill, so be sure not to cook it for too long. You’ll know it’s ready when it starts to flake easily with a fork. Also, keep in mind that it will continue to cook a little more after it’s taken off the grill. Add the white sauce, also called crema! The white sauce in this fish tacos recipe is easy to make and really binds all of the ingredients and flavors together. 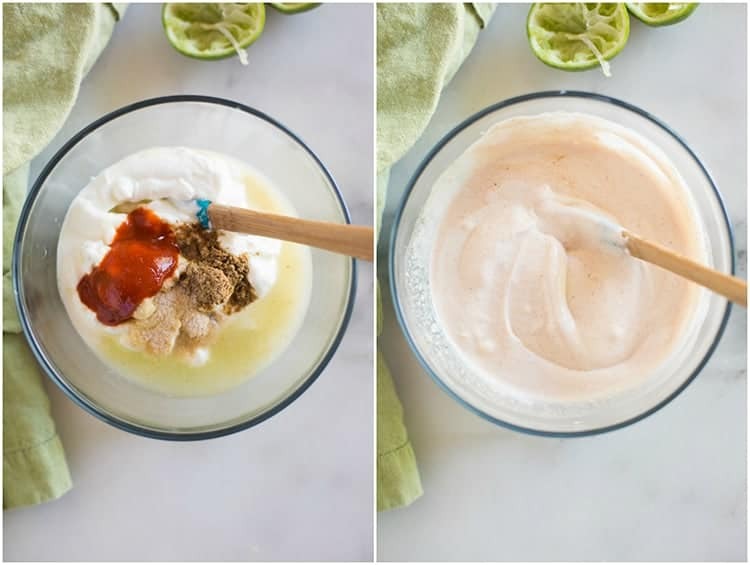 Add the sour cream (or substitute Greek yogurt), mayo, lime juice, and seasonings to a bowl and stir to until smooth. The fish marinade and white sauce can both be made a few days in advance and stored in the fridge. Good toppings is where the magic happens, and where you can really take these fish tacos from good to great! Shredded cabbage, fresh cilantro and pico de gallo are musts. If you don’t have what you need to make fresh pico de gallo, you could substitute your favorite salsa. We also like fish tacos topped with chopped avocado, a sprinkle of cotija Mexican cheese, and a squeeze of fresh lime juice. This dish is a winner in flavor and freshness, and I love that it’s a healthy dinner you can throw together in less than 30 minutes. 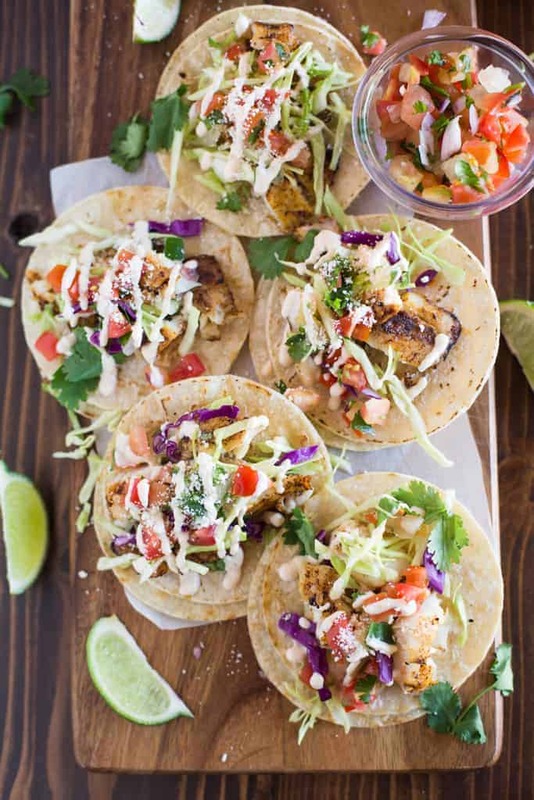 Hope you enjoy these delicious, fresh and healthy grilled fish tacos as much as we do. 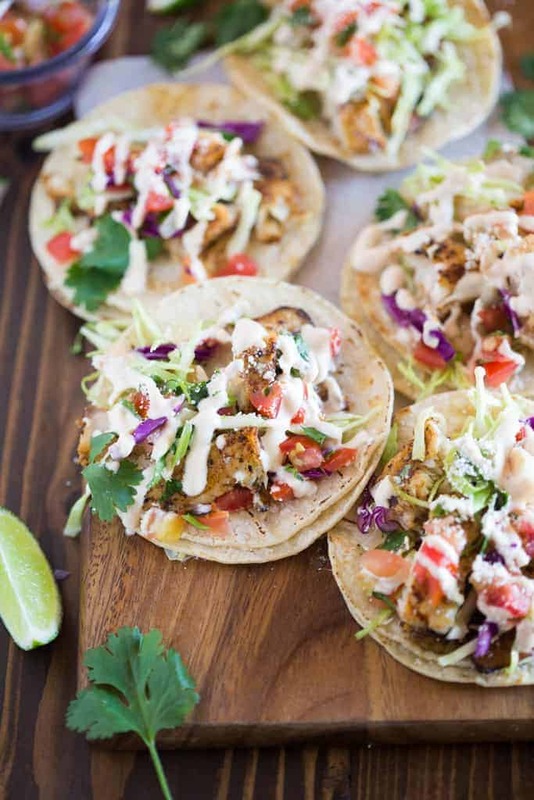 Fresh, flavorful, and healthy Grilled Fish Tacos loaded with all the best toppings, including cabbage, pico de gallo and a simple homemade white sauce, or "crema". Ready to eat in less than 30 minutes! Serve with a side of Authentic Mexican rice. Find my tips for perfect fish tacos, above in the post. It is Cotija cheese NOT Cojita cheese. This is the recipe I use every time I make fish tacos. So delicious. My husband and daughter love them too. Yes, that would be fine! Enjoy. I thought that one was never to salt fish until it was in the pan cooking or it would dry out. I’ve not tried this recipe but I am wondering if anyone has noticed if their fish is dry from salting then marinading. I love this recipe! Sometimes I omit the tortilla and use the cabbage as the base for the fish. Either way it’s a gluten free recipe as well, and the fish tastes best when grilled ( can roast or grill in oven).